For this new edition of Poster Monday we have a poster from the talented Elmer Sosa, a graphic designer based in México. He is a Master in Marketing, Graphic Designer, Illustrator and Professor, was a beneficiary of the Program for the Creation and Artistic Development 2015-2016 (Puebla), is a member of the Mexican Association of Illustrators, Ambassador of Latin Design by the University of Palermo Argentina. Elmer Sosa won many competitions and awards, His work has been exhibited in Peru, Bolivia, Venezuela, Cuba, France, Ukraine, Spain, United States, Russia, Czech Republic, Japan and China. 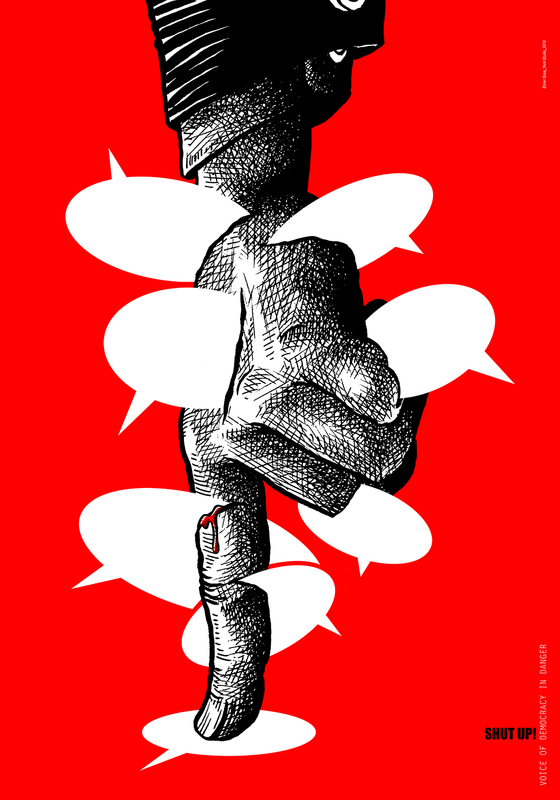 The poster we are featuring here today, Shut up¡, was selected for the exhibition SHUT UP! Voice of Democracy in Danger that has traveled several countries. Press freedom is one of the main ingredients of democracy and currently organized crime and some governments have repressed, jailed, exiled or killed journalists and communicators who denounce corruption, crimes or who disagree with government systems; The Reporters Without Borders organization reports in 2018 about three hundred violations of press freedom among journalists killed and imprisoned in the world. Elmer is Art Director of Yomi Yomi Studio, Political Caricaturist of Diario Cambio in Puebla, Illustrator for different publishing houses and Professor in different Universities, If you want to find out more about he visit his personal profile at behance.